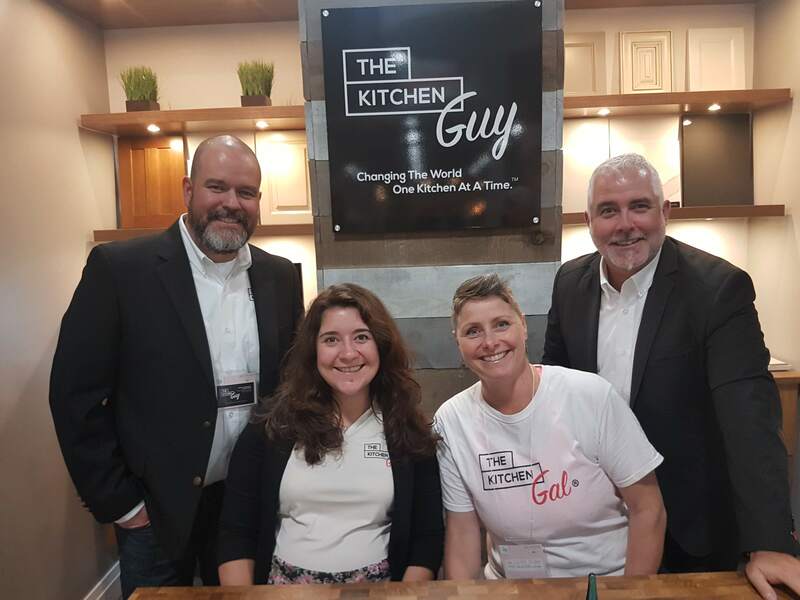 André and François share The Kitchen Guy’s mission and the overall experience at the Ottawa Fall Home Show. André: about the company…basically I wanted to offer my clientele something different, more or a personal approach and the process of developing their dream kitchen. In the past I noticed that there’s a lot of of missing fragments to the process where customers left on their own, trying to figure out or navigate through a very complex project and that requires a really important investment for their homes. So I want to break down those processes and basically take them by the hand from the beginning right to the end and that’s what we specialize in. Question: We’re at the Ottawa Home Show. Tell me, why did you guys decide to do a Home Show? François: Well, we’re always looking for strategies to increase quality leads, meet cool people, serious people that want to redesign and transform the heart of their home that’s the kitchen. That’s what we love. It’s a living space that we can really work on and people are passionate about it and it’s a magnet. People gravitate towards that space so we want to make sure that we focus on function, we focus on aesthetics and we’re able to deliver on that. Why we’re here? We’re in full growth mode so we wanted to see what the Show can bring us. So far it’s been amazing. We actually won Best Use of Small Space Award with André’s design and we’re pretty happy with that, we weren’t expecting it and we’re meeting great people. We’re meeting great potential customers and the general feel and atmosphere is great. Question: You guys have a really great location. How many people would you say have come by? How many leads would that turn into? François: we’re still only mid-way through, a bit past mid-way through Saturday. We probably have 25 to 30 solid leads with actual scoped projects. André: based on real conversations that we’ve had. People that have taken the time to talk about their projects and get a good sense of them and them of us and they were open about giving us information for follow-up of their project. François: So these are qualified leads and we’ve probably handed out over a hundred show cards/business cards that we’ve put together and so I’m thinking you know, we’ll probably double that in terms of the potential business and we’re not done yet. Question: What else do you guys do for marketing? Like a market that’s hard to decide where to put your marketing dollars. What else do you do and why did you decide to do the marketing here? François: Well, we’re very strong online so our organic reach on search engines is quite high. We have an integrated social media strategy and so we love to connect, we love to share what we do and have people share so we do a lot of promotion there. What I like about this approach it’s that it’s brick and mortar and we get a lot of referrals so this is a better way to connect. We’ve had dozens of customers meet us at the show and past customers, past clients. Question: So what are your thoughts? We’re halfway through the show. Are you guys enjoying it? What do you love about the Home Show? André: I’ve been to the Home Show quite a few times but as The Kitchen Guy the first time. I really enjoy the open concept that it is this year. The middle section is open, especially to our booth. You can see us from right down the center as you come in. I kind of enjoy that aspect. Question: So how did the Show Team at Expo Media help you guys? François: Chris reached out to us, our rep. He reached out to me probably last spring. We’re in September now so this was probably in March or April. We were evaluating what we were going to do for the year. He followed up with me in June. I said, let me talk to André and we’ll make call by the end of July. We did make that call and when we do things, we do them solidly. The minute we committed, we took off. He was heading on holiday. I came to the seminar. I’ve done hundreds of Shows in other industries in the past so I’m bringing that in with André’s expertise as the design specialist and the original Kitchen Guy. Bringing all that together has been great and with the help of the Show staff. Robert’s been great, Katie’s been great so when we had questions, the coordination to bring us to where we are now has been remarquable. Question: So you said you’ve done a lot of Trade Shows. How do we compare to other trade shows? André: Well, I really like the flow. I find the quality has been a lot better. There is serious clientele coming through you know. They’re not just …It’s not like a circus atmosphere you know. They’re not here for balloons. They’re really here because they have a project in mind and I think that’s the difference. Question: Awesome. OK. You guys did a great job. Why don’t we close off by saying: We’re the Kitchen Guys and we absolutely love the Ottawa Home Shows…and you guys are coming back, right? A- Yep, we’re talking about it. Question: Why don’t we close off by saying: We’re the Kitchen Guys and we absolutely love the Ottawa Home Shows.